Dec 06, 2018 (LBO) – All Ceylon Makkal Congress (ACMC) said that they are committed stakeholders of Sri Lanka’s democracy but not striving to promote deposed Prime Minister Ranil Wickremesinghe as an individual. “We do not have any personal passion for the individual, Ranil Wickremesinghe. There are no ‘relationships’ between ACMC and the UNP either,” said the Leader of ACMC Rishad Bathiudeen. 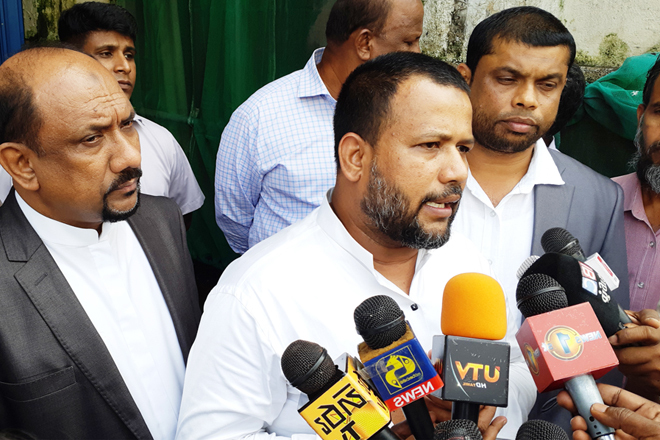 ACMC Leader Bathiudeen was addressing the press immediately after returning from the Police Headquarters giving his statement to CID on the alleged plot to assassinate him as revealed by the media recently. “We are against the illegal appointment of Mahinda Rajapaksa as Premier. President Maithripala Sirisena has used a power he does not have as President, in making this appointment,” he said.